Praia do Carvalho is a spectacular beach near Lagoa. The relatively small beach is famous for its stunning scenery and crystal clear water. Teenage kids love to go here, because it is the best place to go cliff jumping. 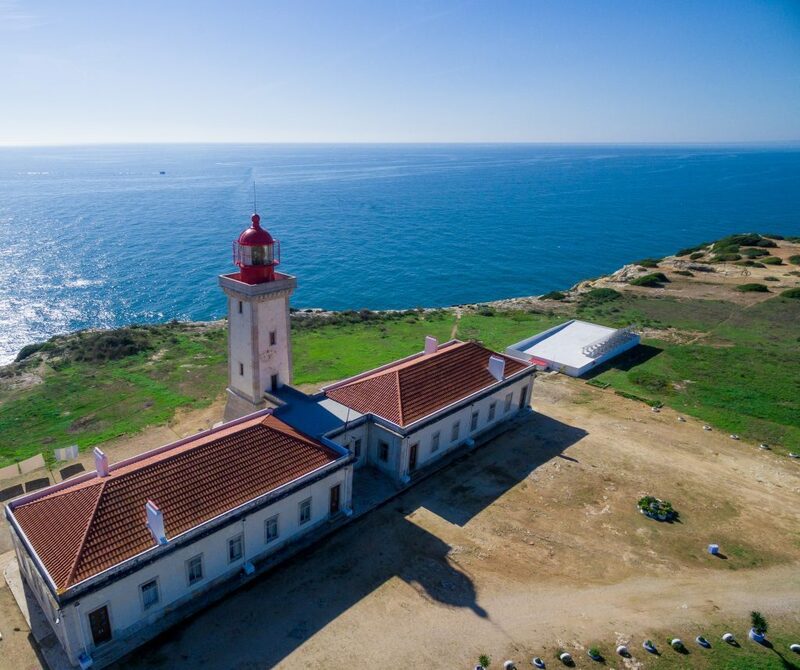 To get an idea of the impressive surroundings of Praia do Carvalho, watch the short video below. 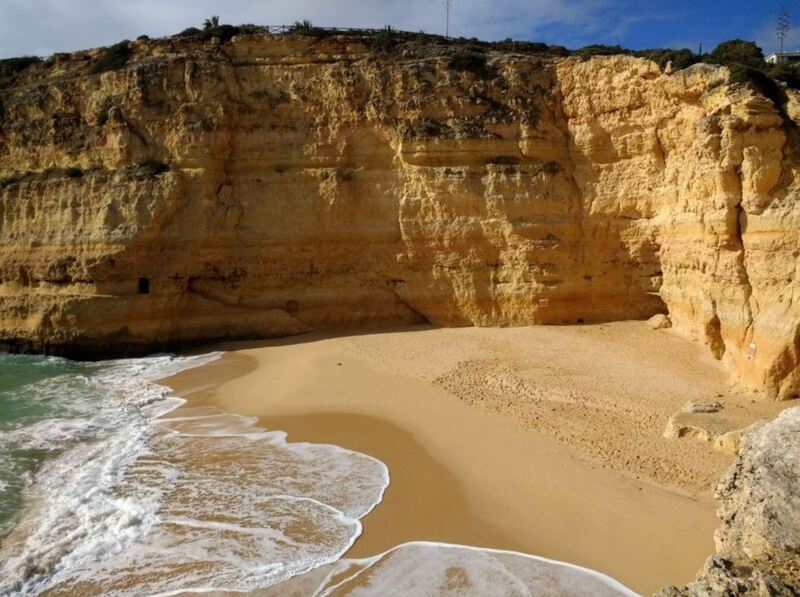 Praia do Carvalho is quite a small beach, surrounded by steep cliffs. The combination of size and scenery gives the beach a magical and romantic feel. The beach is kind of shaped in a V. The sand on Praia do Carvalho is fine and golden. It is quite soft and feels very nice. Since the beach is surrounded by high cliffs, the beach is covered in shadow quite early in the evening. If you are staying for the whole day, the best thing to do is sit on the left side of the beach. This is the area where you will have the longest period of sun. The good thing is that these cliffs provide shelter against the wind and even shadow. Be warned that you should not sit directly underneath the cliffs, because there is the risk of rocks falling. Praia do Carvalho is a relatively quiet beach. There are no hotels or resorts directly on the beach. In the winter and spring, the beach is almost deserted. 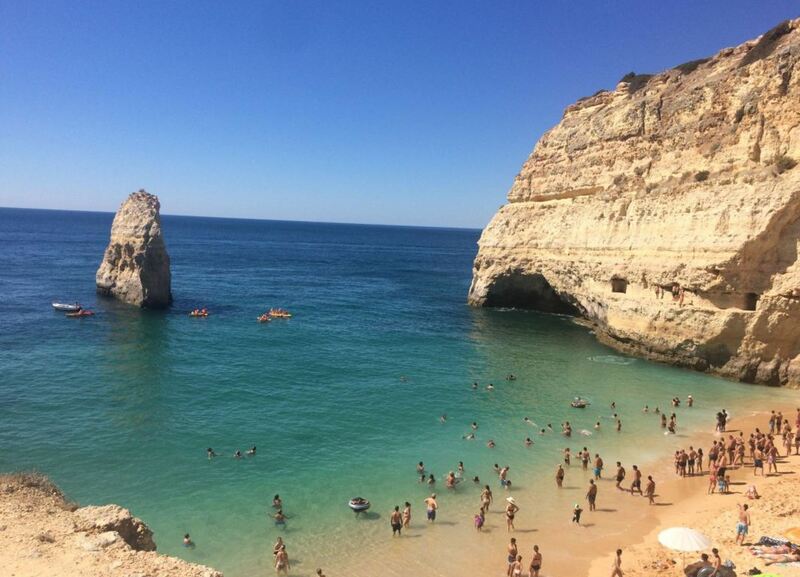 In the summer, the beach is mostly visited by Portuguese people and by tourists who are staying in Carvoeiro. Even though the beach is busier during the summer, it never gets completely crowded. The beach is definitely less crowded than most of the other beaches nearby. 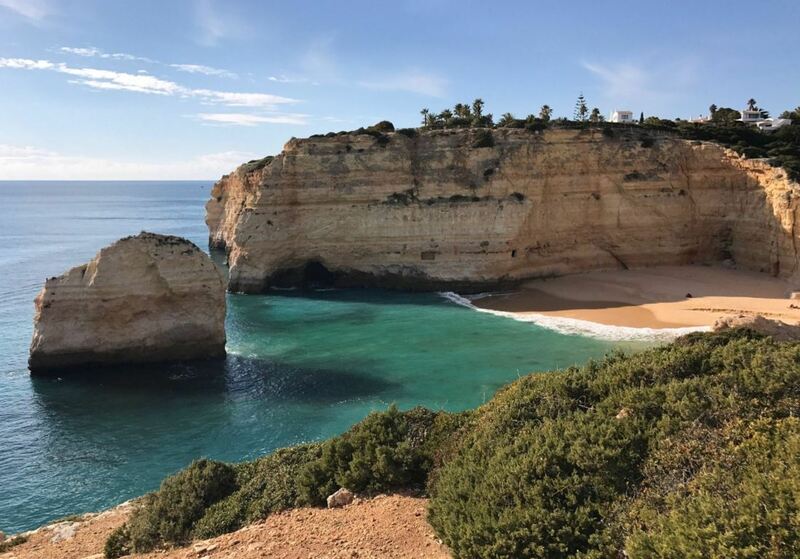 This makes the beach perfect for those who want to get away from the crowded beaches that you can find in other parts of the Algarve. According to locals, this beach has been named after a captain called Carvalho, who supposedly owned this beach back in the days. The water is exceptionally clean and the sea is calm. It is so crystal clear that you can often see fish swimming in the water. 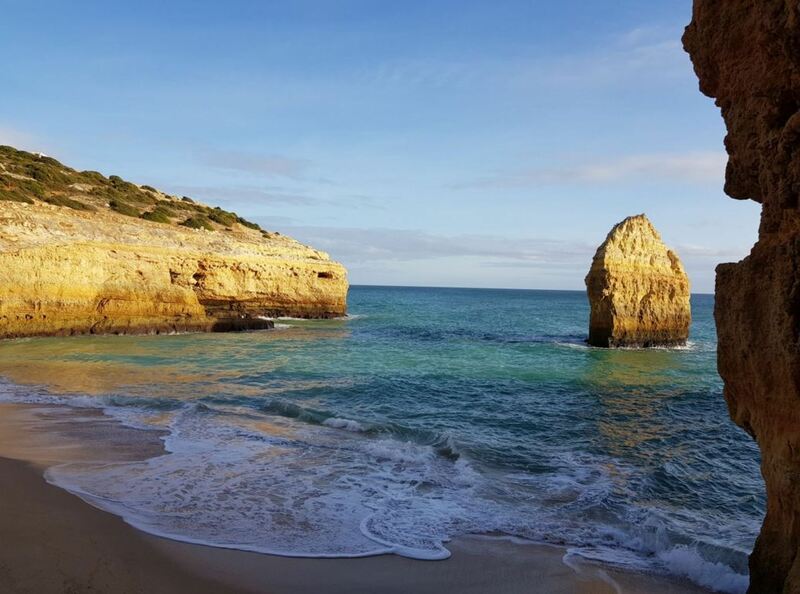 Praia do Carvalho is one of the best places for snorkeling in the Algarve. So make sure to bring your snorkeling gear with you! The sea is shallow in the beginning and then becomes deep very quickly. Thus be very careful with children in the water. Also beware that the current can be quite strong here. It is not the best beach to swim far out into the sea. To access Carvalho beach you need to walk through a man-made tunnel in the rocks. In this tunnel you can see several fossils. This is the only way to access the beach. The whole experience of the tunnel adds to the awesomeness of Praia do Carvalho. The tunnel has some steep and uneven steps. This makes the beach hard to reach for older people or for people in a wheelchair. Also watch out for sand on the steps. It might make them slippery. 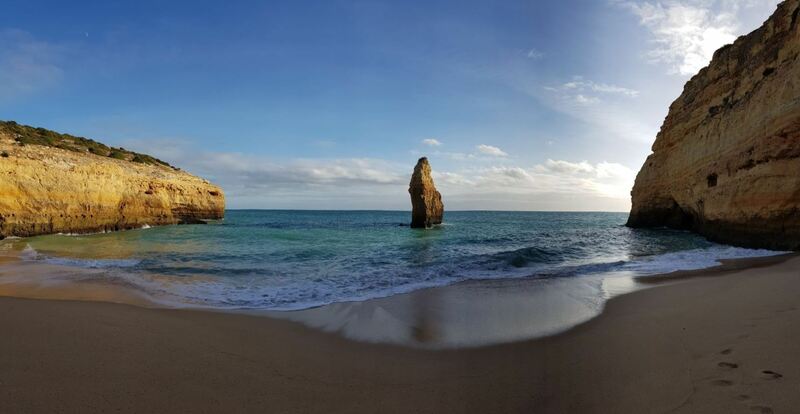 The area near Lagoa is famous for its impressive rock formations. 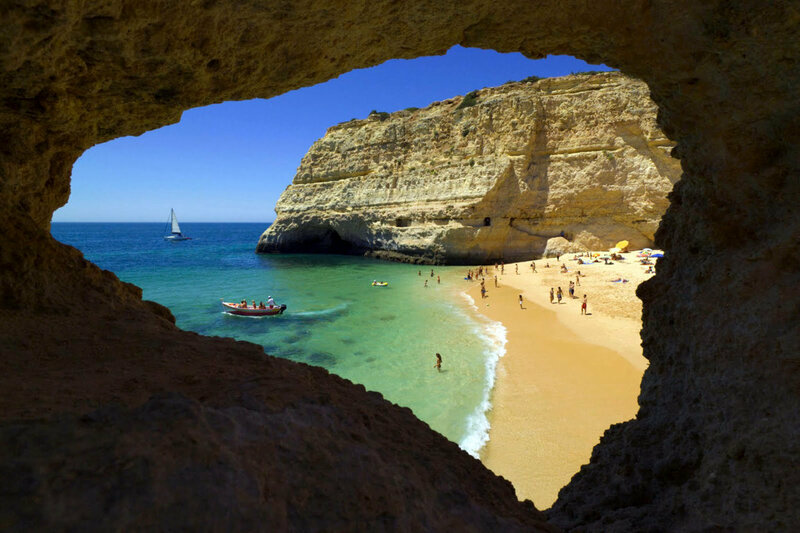 Near Praia do Carvalho you will find a rock formation known as the window, which looks out over the beach. It is the result of many years of erosion. 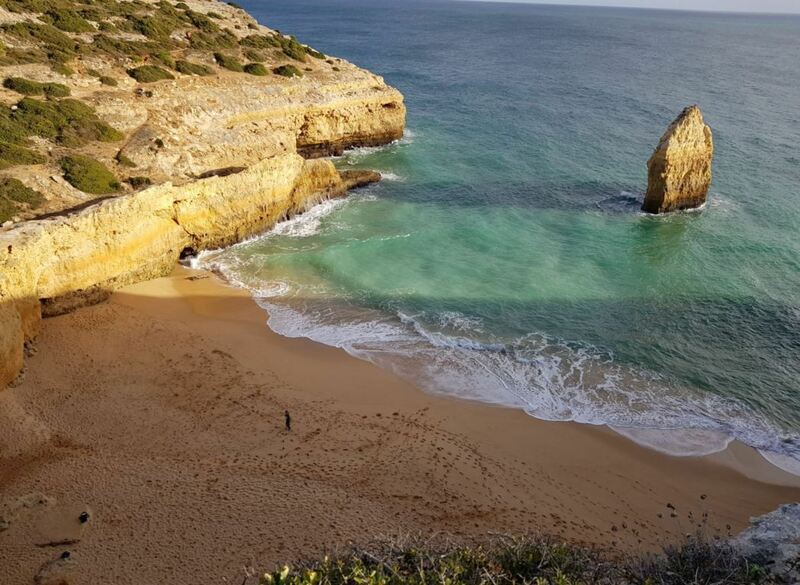 From the cliffs you can walk to the west, all the way to Praia de Vale Centeanes, or even to Carvoeiro. It takes about 25 minutes to walk to Praia de Vale Centeanes. On the way, you will pass the Alfanzina lighthouse. The walk gives you amazing cliff views over the area and the caves below. It is quite safe, as long as you stick to the walking trail on top of the cliffs. Make sure to bring comfortable shoes and some water. This walk is highly recommended. From the cliffs near Carvalho you can also walk east, in the direction of Benagil. 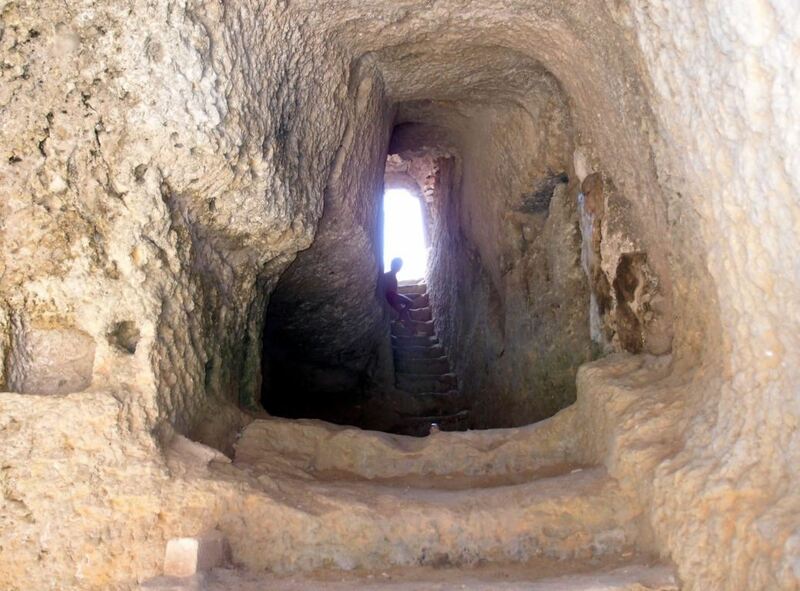 Make sure to watch the Algar de Benagil from above, which is probably the most beautiful cave in the Algarve. On the right side of the beach, you can walk into an opening in the cliff. The opening takes you to a ridge, from where you can jump in the water. The jump is about 5-7 meters. 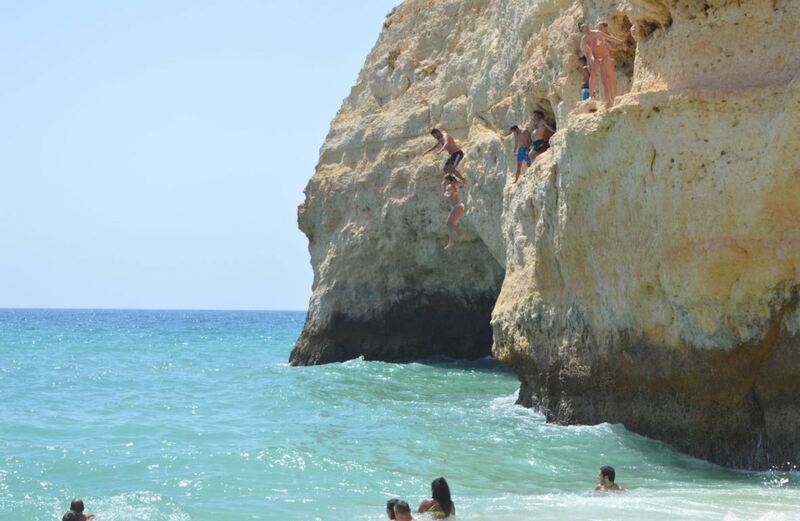 On the left side of the beach, there is a higher cliff that allows you to jump in the water. To get there, walk all the way around up on the cliffs. This is much higher than the first jump, and takes a lot of courage to jump from. The water here is very deep, so don’t worry that you will hit the bottom of the sea. Be warned that jumping from this high can hurt your feet the moment they touch the water. Jumping from any of these sides is not dangerous, since the water here is very deep. Especially teens love to jump from the rocks. And even if you do not choose to jump from the rocks, it can be highly entertaining to just watch the people that do have the courage. Praia do Carvalho is slightly harder to find than some of the other beaches nearby. 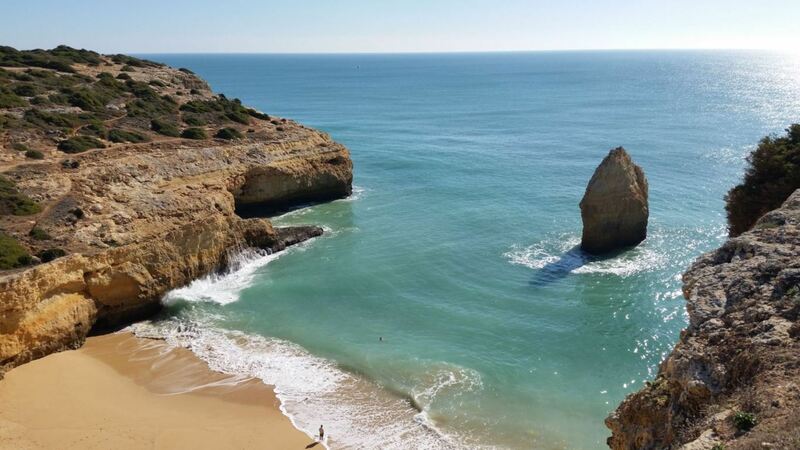 To get to Carvalho beach, you can enter the following address in your GPS: Rua de Algarve Clube Atlântico H15, Lagoa, Portugal. Otherwise just drive on the EN125 near Lagoa and follow the signs to Carvoeiro. When you get closer, you will see signs indicating Praia do Carvalho. Coming from the Carvoeiro side, you can park your car at the Urbanização Clube Atlântico. When you come from the other side, you can park your car on the cliffs near the beach. Parking is free, and usually it is very easy to find a parking spot. After you parked near Clube Atlântico, just follow the signs and take a long stairs in the direction of the beach. At the end of the stairs you will reach the tunnel that gives you access to the beach. La Bella Vita. This Italian restaurant has great food and service. From the outside this place doesn’t look special, but the quality of the food will surprise you. Julio’s Restaurant. This Portuguese restaurant has amazing food and friendly service. The restaurant is a bit more expensive than others, but it is worthwhile. Restaurante Jardim do Farol. 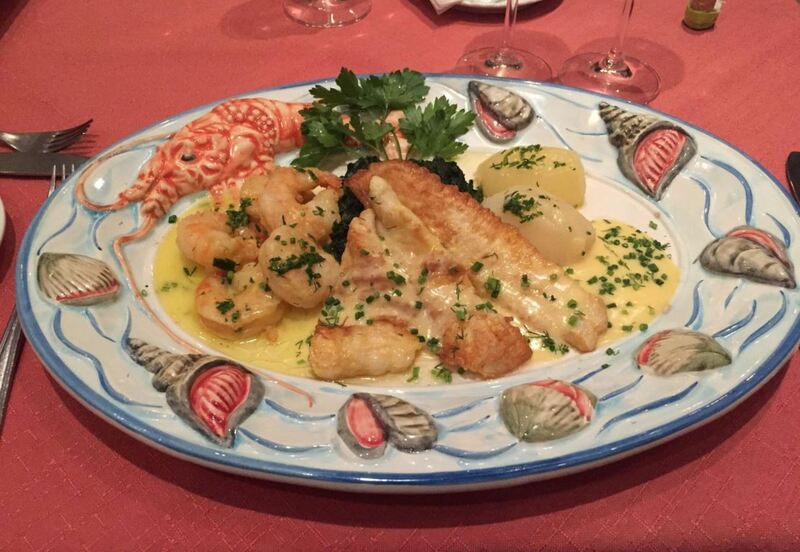 This restaurant serves Portuguese food and specializes in fresh fish and seafood. The staff is very nice as well. Well worth a visit. Hotel Baia Cristal Beach & Spa Resort. This 4 star hotel has a great location, with nice views over the sea. They offer several swimming pools and wellness facilities. Also, they provide a great breakfast. B&B Casa da Colina. This highly rated bed and breakfast has amazing seaviews and offers a modern kitchen so you could cook your own meal if you would like. They even have a nice swimming pool to enjoy your holiday. Rocha Brava Village Resort. This 4 star resort offers many facilities, including several indoor and outdoor activities. Some rooms have their private balcony with views over the Atlantic Ocean. After the busy summer season of last year, we recommend to book your hotel now, as it will probably sell out. Below you can find a map with the location of hotels near Praia do Carvalho. By changing the date of your holiday, the map will show you the current prices. Praia do Carvalho is situated between Praia de Benagil (to the east) and Praia de Vale Centeanes (to the west). If you go slightly further west, you will end up in Carvoeiro. 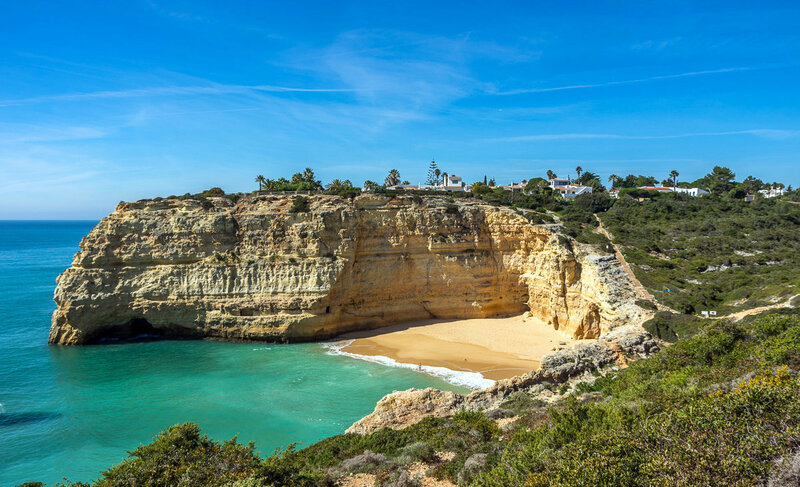 From Carvalho Beach to Carvoeiro it is only a 10 minute drive, and you could walk to Benagil in about 15 minutes. Carvalho beach is also quite close to the holiday resort of Rocha Brava. 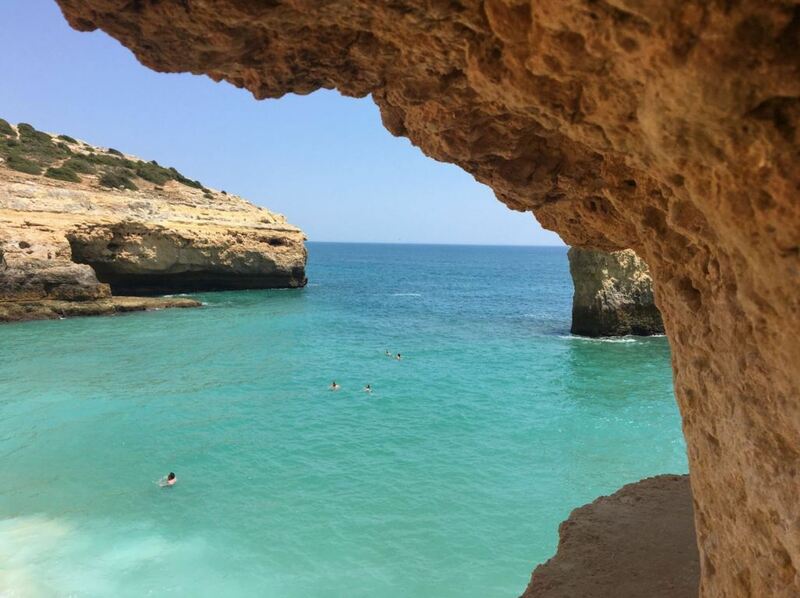 The coast near Carvalho / Benagil / Carvoeiro is full of beautiful caves and grottoes. 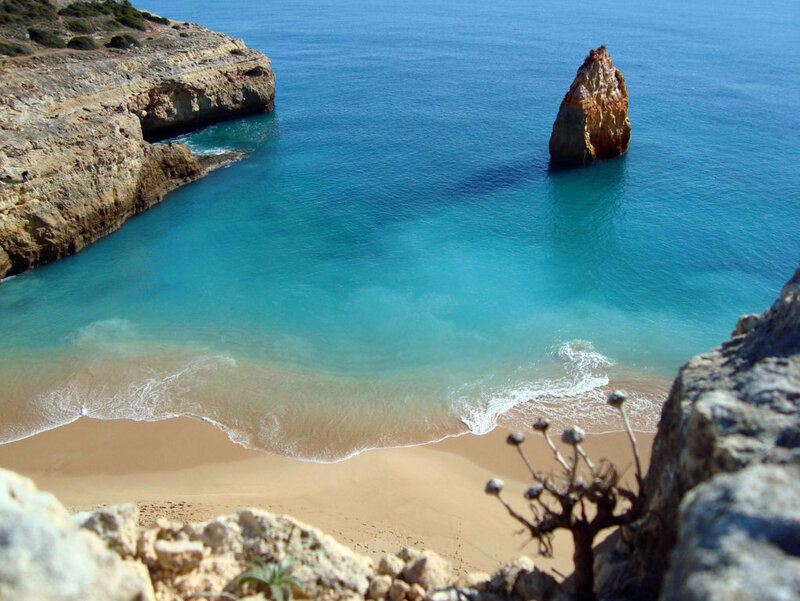 It is wonderful to explore this part of the Algarve by boat. You can book a boat tour in Benagil, or you can book some excursions already online. Below you can find our recommended tours in this area. Unfortunately, there are almost no facilities on Praia do Carvalho. 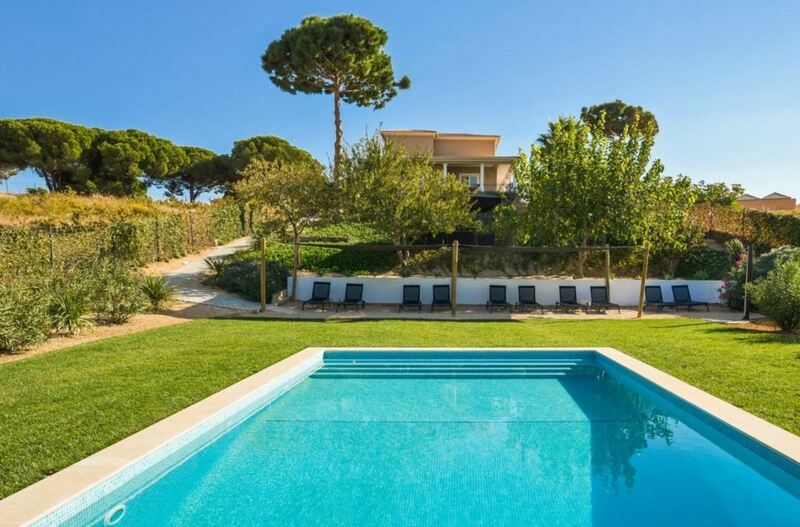 If you really need facilities, you have to go to Clube Atlântico or to Carvoeiro.